I set out for the parking area off of SE Maple Valley Highway, right before the Auburn-Echo Lake Cutoff road — across from Foley’s Produce — this morning to a cool 64 degrees. Which makes for the best biking weather, in my humble opinion. My goal was to ride from there to the start of the Cedar River Trail at the south end of Lake Washington, about 12 miles away. I started about nine in the morning and got to the lake around 10:45. Not bad for a morning cruise. One of the great things about our Regional Trails System, in general, is that most are built in former rail corridors, so they’re pretty flat, which translates to easy cruising – making our trails great for the whole family. I saw a variety of visitors, from geared-out bikers and runners to a dad on rollerblades with a dog and stroller. Another thing I love is finding new and interesting areas I wouldn’t have known of otherwise. Whether that’s a stop off at the Testy Chef, or rolling down a short Seattle Public Utilities trail to find the Van Ness Natural Area, a small site with a few interpretive signs explaining the role of the Cedar River in our local watershed. One thing I always try to do on my rides is stop and talk with anyone I meet along the way, whether daily user, tourist or traveller, or in this case – one of our awesome South Trails Maintenance crew members. I was lucky to run into Anthony Haapasaari as he was rolling down the trail in the Bobcat, using the turbine blower to remove slippery leaves. Anthony has been with King County for over 30 years and loves talking about the history of the region and the trail. He was proud to work for the South Utility Trails Crew and loved his interactions with trail visitors. An amateur history buff, Anthony regaled me with stories of the region’s history and pointed out a couple historic sites I’ll have to check out. I’m glad I stopped to talk with him. 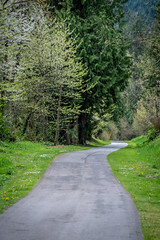 Not long after, I popped into the city of Renton and dropped down onto their portion of the trail along the river. The sun was warm, and the Cedar River ran strong and clear. A few people were walking the trail past the Renton Library, but mostly I had it to myself. The smells of falling leaves were already in the air as I followed the trail to its start at Lake Washington. I’d definitely suggest hitting up the Cedar River Trail while the weather is good. It’s a great trail for the avid biker and weekend cruiser alike and has gorgeous views of the river along its full 17.4 mile route (4.8 of which is unpaved soft surface). Get out into Your Big Backyard and explore! Previous Post Congrats to our very own King County Parks employee, Jordin Andrade, for a successful run (literally) in Rio!